Oh, for Pete’s sake! February 26 is actually a “holiday” called For Pete’s Sake Day – celebrating those handy-dandy euphemisms like “crickets” & “jeepers” that make The Happy Hollisters so charming! To celebrate, we’ve created a glossary of “Happy Hollisterisms” – over 50 nifty old-fashioned terms and expressions along with their meanings. Impress your friends with these dandy “new” words, bits of classic 1950s lingo and regional expressions that you may not have heard in a long time . . . if ever! These words and phrases were really swell in the 1950s and ‘60s; you can wow your parents, grandparents, maybe even your great-grandparents, by making their old slang new again! (Page numbers in parentheses refer to the The Happy Hollisters (volume 1) paperback edition, unless noted otherwise.) Words preceded by ► are additions to the list as of February 2014. Bossy (page 146) When Farmer Hill offers Pete and Pam a glass of warm milk that he “just got from Bossy,” he doesn’t mean he got it from his overbearing wife. “Bossy” was a generic cow nickname back in the day when owning livestock was more common, just like “Fido” is sometimes used for dogs today. Cats were called “Tabby,” and “Dobbin” was a horse. And in case you’re wondering, Farmer Hill wasn’t offering to heat that milk up in the microwave – it was already warm because it came straight out of Bossy. Yum! Cellar (page 28) You’d think the Hollisters, living in quaint, suburban Shoreham, would have had a finished basement with carpeting, swag lights and a pool table, but Pete says they have a cellar, and he knows best. But a cellar is typically an underground storage area with dirt walls used to store fruit and vegetables, and it isn’t always directly beneath a house. The cellar is where Dorothy was headed in The Wizard of Oz, when she’s trying to pull open those big, heavy doors in the ground to escape the cyclone. Crickets (page 61) Pete uses this as an exclamation of distressed surprise. Everyone thinks Pete is such a polite, clean-cut kid, but it turns out “crickets!” is actually pretty darn close to swearing! (Say it ain’t so, Pete!) “Crickets!” may be a shortened and cleaned-up form of “Jiminy Crickets!” a minced oath or euphemism for a two-word curse with the same initial letters letters. Jerry West was clearly up on his contemporary pop culture: the character “Jiminy Cricket” is familiar from Disney’s Pinocchio, and the phrase is also used by Dorothy in The Wizard of Oz, when she is startled by the thunder and lightning inside the wizard’s chamber. It also was used in the 1930 film, Anna Christie, starring Greta Garbo. Her character’s Swedish father (see where I’m going with this?) uses the same exclamation several times. Maybe Jerry West, aka Andrew Svenson, heard the expression from his Swedish father, Sven Andrew Svenson, or from his even more Swedish grandfather, Carl Edward Svenson. Dandy (page 72) One of those squeaky-clean adjectives meaning “mighty fine” that the Hollisters are so fond of! See also keen and swell. ►Dinette (page 105, Volume 2, River Trip) The dinette of the Sweetie Pie, Uncle Russ’s boat, was an eating area that was magically converted to a big double bed. Drum majorette (page 70) This is a person who leads a marching band, usually carrying a baton. Just like a drum major, except a drum majorette is a girl. Dungarees (page 82) In 1953, girls wore dresses or skirts most of the time, but a nice little girl would not clamber onto a merry-go-round wearing a dress. For special occasions, like a picnic in the State Park, she might be allowed to wear dungarees – heavy blue fabric fashioned into pants or overalls. You probably own a pair of blue jeans; pretty much the same thing. ►Expressman (page 34, Volume 3, Sea Gull Beach) In the Happy Hollisters’ day, packages were usually delivered by an employee of the company or firm where they originated, not by a 3rd party delivery service. For example, Tinker might personally deliver an order from the Trading Post directly to a customer. Expressmen were more like UPS or FedEx drivers, delivering packages from a variety of establishments. ►First-rate (page 65, Volume 2, River Trip) “First-rate detecting” implied that the Happy Hollisters were doing a good job tracking down Old Moe. The original meaning of first-rate, however, doesn’t necessarily mean good. It referred to the number of men or cannons on a naval ship; the more men or cannons, the higher the rating, so first-rate is better than second-rate. Flapjacks (page 32) You might call them pancakes, griddlecakes, or hotcakes. Many of the Hollisters/Svensons actually prefer waffles. Flashbulb camera (page 110) Not so very long ago, before digital cameras with automatic flashes, there were instant film cameras, also known as Polaroids, and they were the cat’s pajamas. (See dandy, keen and swell.) 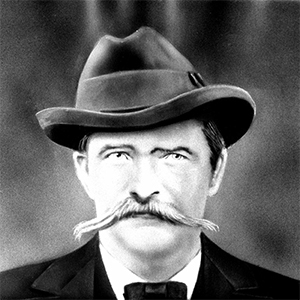 Since Mr. Hollister was an inventor, he probably enjoyed having all the latest high-tech gadgets. These fancy cameras had special photo paper inside that developed right inside the actual camera, without darkroom processing, negatives, printing and all that. The flashbulb was single-use and looked just like a very small light bulb. Frankfurters (page 91) A frankfurter is a sausage made of beef or pork, originally made in the city of Frankfurt, Germany. You could say it’s the same thing as a hotdog, but Mrs. Hollister did not simply pick up a package of hotdogs at the grocery store. She would have made a special trip to the butcher. There she would have purchased a “string” of linked frankfurters which she would separate with a knife or scissors. You really don’t want to know what that “string” is made of. Trust me. Gay (page 34) It means happy. Giant Steps (page 93) This is a game similar to “Simon Says” or “Mother May I?” One child stands at the finish line and acts as “it.” The remaining children line up at the starting line and advance toward the finish line by asking permission to move a certain number of steps. The child acting as “it” may allow or deny the movement, and if movement is made without permission the offending child moves back to the starting line. This may explain why the Hollister children were so well-behaved, since games of this type may have been created originally to reinforce proper manners. Golly (page 77, Volume 3, Sea Gull Beach) A simple little interjection? Not really – it’s a euphemism for “God” dating back to the late 1700s. It was very popular in the 50s and 60s – remember Gomer Pyle? ►Hokus pokus (page 106, Volume 2, River Trip) Often spelled hocus-pocus, and used in magic tricks to announce a baffling trick, such as pulling a rabbit out of a hat. According to Wikipedia, the origins of this phrase are unclear. It may be based on the liturgical Latin phrase hoc est corpus meum meaning “this is my body.” It could be related to the name of a sorcerer in Norse folklore, Ochus Bochus, or simply a magician’s invented phrase, concocted to sound like flowery, mysterious Latin. In any case, anything hokus pokus sounds like a bit of a hoax. ►Hurrah (page 71, Volume 2, River Trip) Three cheers for hurrah, hurray, hoorah, hooray, huzzah, and rah rah! Zowie, there are a lot of different ways to show excitement! ►Jalopy (page 76, Volume 3, Sea Gull Beach) See Beach buggy. A jalopy is a run-down or outdated motor vehicle. Jeepers (page 99) Another exclamation of shock or surprise, and probably one of those handy minced oath euphemisms (see crickets). “Jeepers Creepers, Where’d You Get Those Peepers?” Thanks Harry Warren, Johnny Mercer, and Louis Armstrong! Jiffy, in a (page 82) Really fast. Keen (page 107) Another good old-fashioned adjective in the dandy and swell group, another way to say something is really great or interesting. Knolls (page 90) People just don’t use poetic words anymore; this one means small hills, but it sounds much prettier. Lapland, Lapp children (page 95) Lapland is a region of northern Europe including parts of Norway, Sweden, Finland and the Kola Peninsula. The Lapps are the nomadic reindeer herders of the area, who now prefer to be called the Sami people. Andrew Svenson loved to travel, especially to exotic locations like Lapland, and often worked his destinations into stories to make them more educational. Laundress (page 46) Donna Martin’s family had a laundress, a woman hired to wash and iron the family clothing and linens. Elaine Hollister was a stay-at-home mom extraordinaire who managed her time well enough to do her own cooking, cleaning, and laundering, with time left over for occasional mystery solving. ►Luncheonette (page 53, Volume 3, Sea Gull Beach) On their way to Sea Gull Beach, the Hollisters stopped for hamburgers and milk at a luncheonette. Even though this roadside lunch spot was right next to a pony corral, it had a sparkling clean counter. ►Mackinaw (page 91, Volume 2, River Trip) After a chilly water rescue, Pete dons a mackinaw belonging to Bill Barlow. This is a short coat made of water-repellent wool fabric called Mackinaw cloth that originated in the Mackinac or Mackinaw region of Michigan. Mackinaws are often red-and-black plaid, but of course in the new paperback version, it’s just plain old black and white. Midget auto racers (page 85) These are gas-powered carts operated on a track, usually seen in amusement parks. Andrew Svenson loved auto racing, and developed the plots and outlines for The Wynn and Lonny Racing Series by Eric Speed. His sons Andy, Jr., and Eric Svenson (Pete and Ricky) are remembered fondly by their families for their love of cars, especially fast ones. Even today the Svenson boys (and some of the girls) are into fast cars, motorcycles and racing. Andrew Svenson would be thrilled to know that two of his grandsons are currently active in the auto racing business. Monkey’s uncle, I’ll be a (page 111) This is an idiom used to express surprise that something unexpected has occurred or turned out to be true. The State of Tennessee v. Scopes (the Scopes Monkey Trial, 1925) was still fairly fresh in people’s minds in the 1950s, so this phrase was much more common then than now. Nifty (page 99, Volume 3, Sea Gull Beach) Once upon a time “nifty” meant stylish or clever, but in the Happy Hollisters it could probably be substituted for “swell.” It may have started out as a shortened form of “magnificent.” It’s still a pretty nifty little word. Peddler (page 134) A door-to-door salesman. Back in the 1950s there were a lot of people who went around neighborhoods selling things: books, vacuum cleaners, brushes, even food. Today’s young readers may be surprised at the ease with which Holly talks to a stranger at their doorstep, and how Mrs. Hollister buys strawberries from him without any hesitation. People were much more trusting back then! Pell mell (page 92) Pam runs pell mell, trying to catch the dog that has run off with her string of frankfurters. That is to say, she runs frantically after him. Such action is generally ill-advised, but it’s better than the dog running pell mell after her. That doesn’t happen until the next page. Phonograph, record, needle (page 117) A phonograph is an electrical device that produces sound by means of a needle being rotated against a flat vinyl disk. This disk or “record” is 10-12” in diameter, embossed with grooves in which the needle tracks from the outside to the center, producing the recorded sound. This may be hard to imagine if the only music you have ever heard has come from an iPod. ►Pickaback (page 113, Volume 3, Sea Gull Beach) Some folks say “piggy-back” but with a Shoreham accent it’s pronounced pickaback. ►Picnic hamper (page 82, Volume 2, River Trip) When you’ve got seven mouths to feed on a picnic, you need a really big basket for all that food – pack up the picnic hamper! Poke bonnet (page 113) If you’ve watched Little House on the Prairie or visited Colonial Williamsburg, you’ve seen ladies wearing one of these – a hat with a protruding brim in front, designed to shade a lady’s face from the sun or perhaps from the unwanted gaze of a man. It was also large enough in the back so that all the hair could be “poked” inside, and usually had a cloth strip or ribbon to tie underneath the chin – which would be helpful if you expect a cat to walk in a parade wearing a hat. ►Postmark (page 9, Volume 3, Sea Gull Beach) Way back in the old days before email and Twitter and Instagram, people used to correspond with one another by writing letters. With ink pens. On paper. Then they bought a stamp from the post office, wrote the address on an envelope, put the stamp on the envelope, and took the letter to the post office. 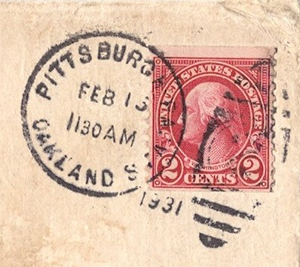 The post office put a “postmark” on the letter showing when it was mailed. And some people think life was simpler back then! ►Prankster (page 62, Volume 2, River Trip) In The Happy Hollisters, prankster is pretty much synonymous for Joey Brill or Will Wilson – someone who is always playing tricks on people! Prowl car (page 176) This is just another name for a police or squad car, but calling it a prowl car makes it sound so much more furtive and mysterious! Queer (page 89) Something that is queer is very odd or unusual, and may come from the German word quer, which means slanting or oblique. At last, a chance to use my German degree! ►Roaring rockets (page 152, Volume 3, Sea Gull Beach) Pete uses this expression to show his excitement at finding an amazing clue. We haven’t found any other literary uses of this term, but can’t help but wonder if its origin might be in the Tom Swift, Jr., series. 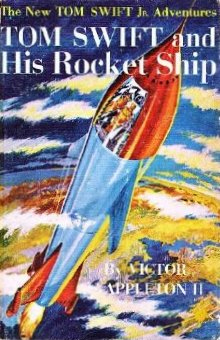 This was another book series which was developed by the Stratemeyer Syndicate during the years when Andrew Svenson was active as a writer and partner in the Syndicate. Roly-poly (page 33, Volume 2, River Trip) Sue Hollister’s little friend Stevie is roly-poly, which sounds a little pudgy, but “roly-poly” is much more fun to say! Shinny (page 84) This word is often confused with “shimmy.” Ricky climbed the merry-go-round pole by shinnying, which means he gripped the pole with his hands and legs and pulled himself up. If Ricky was “shimmying” he would have been doing a 1920s dance move characterized by rapid shaking. And his merry-go-round ride really would have been quite a sight to see! Station wagon (page 12) and tailboard (page 18) If you look closely at the illustrations, it appears that the Hollister family drove a wood-paneled station wagon, sometimes called a “woodie.” In 1953 that was a mighty keen car, one that every large suburban family would have coveted. The station wagon was the forerunner of the SUV: a car with a third seat or a large storage area in the back. The rear door, also called the tailboard or tailgate, folded down – why do you think it’s called a “tailgate” party at a sporting event? ►Super-market (page 115, Volume 2, River Trip) Mrs. Hollister probably did most of her shopping at small family-owned markets or individual shops, like the butcher, the baker, and the candlestick-maker. So when Pam suggested a family trip to the big super-market to stock up on provisions, it was a more unusual event and fun for the whole family – who doesn’t like grocery shopping with five kids in tow? Swell (page 80) If one adjective is most often associated with the Hollisters, it would be “swell,” a most excellent, wonderful, and wholesomely awesome word. ►Telegram (page 145, Volume 3, Sea Gull Beach) Long before long-distance calling became affordable, telegrams were a popular means of communicating written messages over long distances. In fact, tele means distance, and graph means writing. Telegraph operators sent and received messages using Morse code (how fitting for a family who loved using codes) and the messages were printed out and delivered to the recipient. 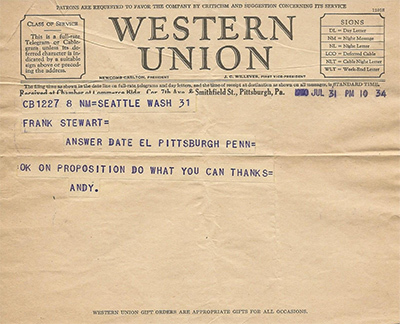 They were especially popular for short business messages, as shown in this 1930 telegram sent by Andrew Svenson to his father-in-law, Frank Stewart. Tourist camp (page 13) Travelers these days are familiar with hotels and motels: a hotel usually has a lobby and interior rooms; at a motel you drive right up and park in front of your room’s door. A tourist camp is much more quaint version of a motel, usually in the middle of nowhere, and each guest/family has their own little house or cottage. Tutti-frutti (page 65) At a good old-fashioned ice cream parlor, this would be ice cream flavored with chopped nuts and candied fruits – fruitcake without the cake. And it makes a perfect name for a cat with mixed colors – but if Tutti-frutti was a calico, why didn’t they just name it Callie, a beautiful name (see calliope) which incidentally was also Frank Hardy’s girlfriend’s name. 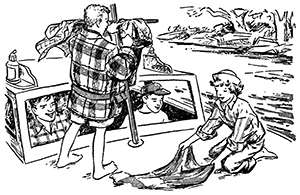 Wild goose chase (page 78, Volume 2, River Trip) The Happy Hollisters go on a lot of wild goose chases throughout the series – pursuing clues that lead nowhere or simply don’t pan out. The historical origin of this phrase is very interesting: “Englishmen in the late 16th century invented a new kind of horse race called the wild-goose chase in which the lead horse could go off in any direction and the succeeding horses had to follow accurately the course of the leader at precise intervals, like wild geese following the leader in formation. At first the phrase ‘wild-goose chase’ figuratively meant an erratic course taken by one person and followed by another; Shakespeare used it in this sense. But later the common term’s origins were forgotten and a ‘wild-goose chase’ came to mean ‘a pursuit of anything as unlikely to be caught as a wild goose,’ any foolish, fruitless, or hopeless quest.” From the “Encyclopedia of Word and Phrase Origins” by Robert Hendrickson (Facts on File, New York, 1997). Yikes (page 91) An all-purpose exclamation of surprise or excitement, and a favorite expression of all the Hollisters. Zowie (page 113) Those Hollisters sure were an excitable bunch! This is another exclamation similar to “wow!” used to show surprise or delight. Should The Happy Hollisters Books Be Read in Order? More Books by “Jerry West”: The Bobbsey Twins!